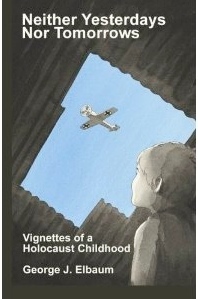 The Holocaust Center for Humanity (HCH) arranged my very first two talks to students in October 2010, and has continued to arrange many more for my subsequent visits to Seattle. 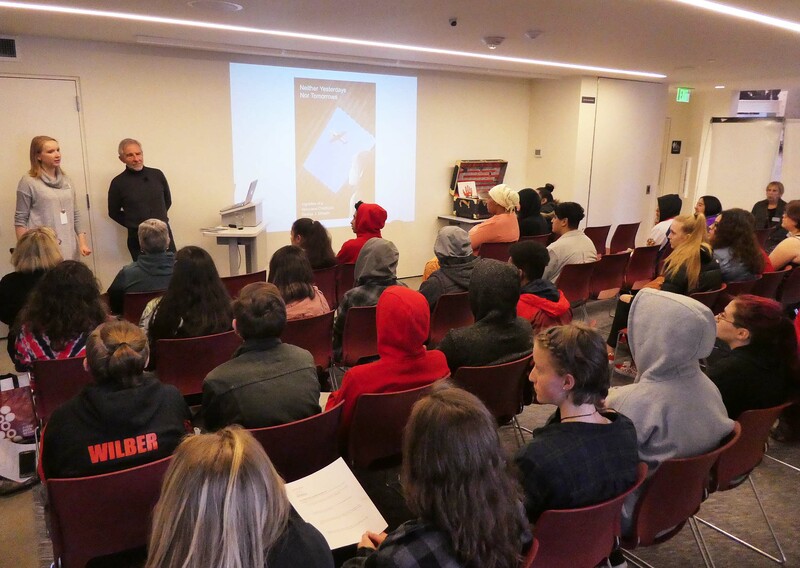 Through the lens of the Holocaust, the Holocaust Center educates students to think critically and inspires them to become champions for positive change. 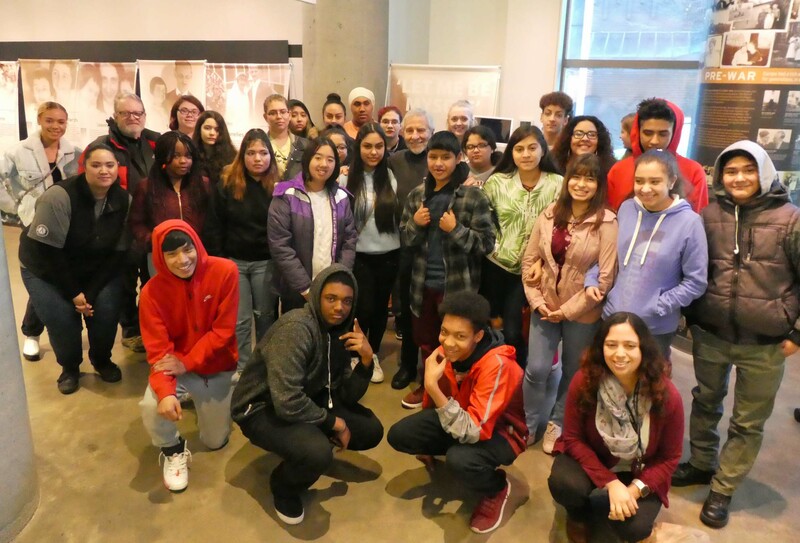 The Center reaches 40,000 students a year in their schools and communities with educational resources, programs and presentations, and provides immersive learning experiences to thousands of additional students at their museum and education center. The Holocaust Center’s impressive facility provides not only space for offices but also for a small museum and, most importantly, for changing exhibitions and educational seminars. A wonderful example of past exhibitions is the exhibit Anne Frank – A History for Today which drew audiences of up to 500 per day, while educational seminars are exemplified by the talks I’ve given at HCH in past years and again today. 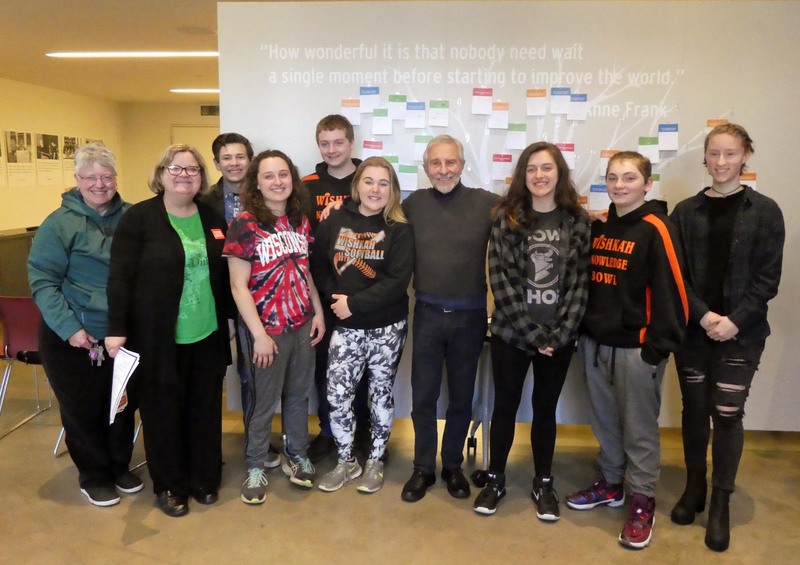 Today’s talk was attended by students from the Evergreen High School* in Seattle, accompanied by teacher Ana-Claudia Magana, and high school students from Wishkah Valley School in Aberdeen on the Olympic Peninsula, accompanied by teacher Betsy Seidel and Dorothy Addison, current bus driver and former teacher for Wishkah Valley School.The talk was organized by Julia Thompson, HCH’s Education Research Coordinator, who introduced me to the audience, and attended by Karen Chachkes, HCH’s Director of External Affairs. *Note – I recently received several fanciful Thank You cards from this teacher and her students, and a statement in one student’s card is especially meaningful and gratifying: “Your story has taught me to be compassionate to others and be a more thoughtful person.” I thank you.